I tried bringing flowers to mom….and of course it had to explode on the floor- but you may notice there’s at least one little heart there in the petals. Then the rice, more parsley, lots of spices and flavoring and so much garlic! I feel like it could use even more still. I don't quite know what spices would be best to use to really flavor everything sufficiently. Seems like it takes quite a bit which I’m not so clear on. Parts ready for the fridge. The onions, beef, and onion “juice” from the caramelizing process. I had rinsed the rice several times. It was VERY cloudy. I don’t believe it was enriched. What I don’t understand is the enriched rice- first why does it need to be enriched? What did they do to it to have it lose nutrition? Also- if regular rice calls for rinsing- what are we not washing away with the enriched one which shan’t be washed? Is it really worth the enriched minerals? And why have I never seen minerals to pour on food to enrich our own food rather than having companies do it for us? And with the non-enriched- what is making the water SO cloudy? I remember I think a video with Chef Ramsay talking about I think it’s washing the starch, to make it less sticky…. 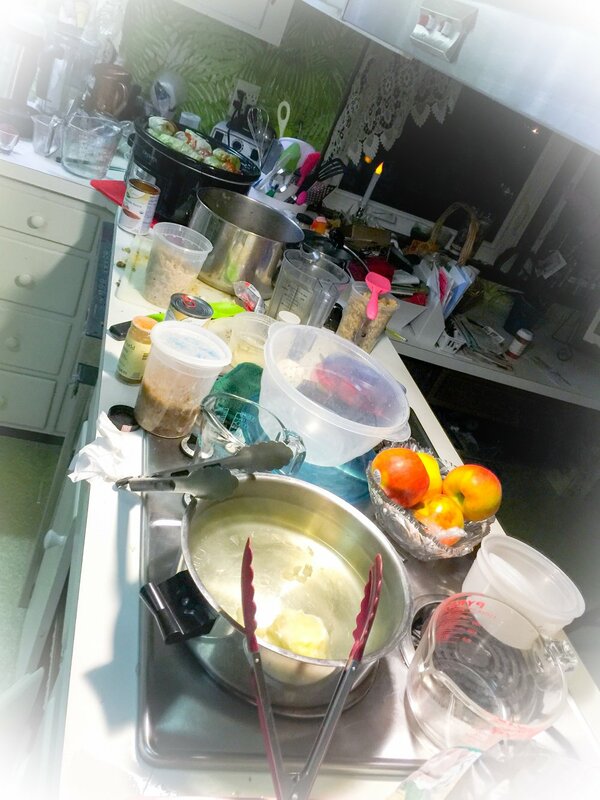 But most of my rice seems to tend to be pretty sticky…. And yet a few grains didn’t seem to cook- so I don’t suspect it’s overcooking…. What’s the deal then? 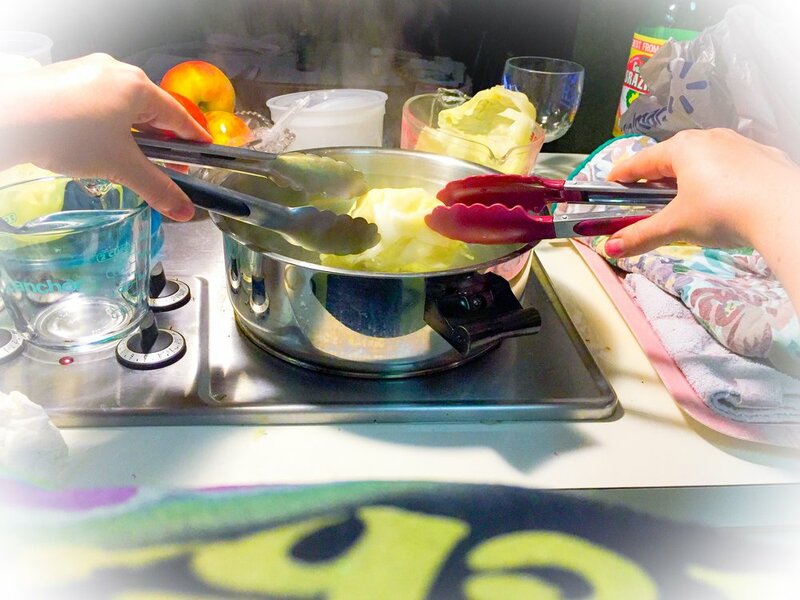 The boiling process of the cabbage…. Eventually required two tongs…. Decided I wanted to try and get a photo of using both tongs at the same time….how to go about that? Why resting the camera held in place by the chin of course! Ok how did this happen? I thought the whole point of the slow cooker was AVOIDING this kind of thing? Incidentally when scraped off it tasted REALLY good! Almost like cheese! 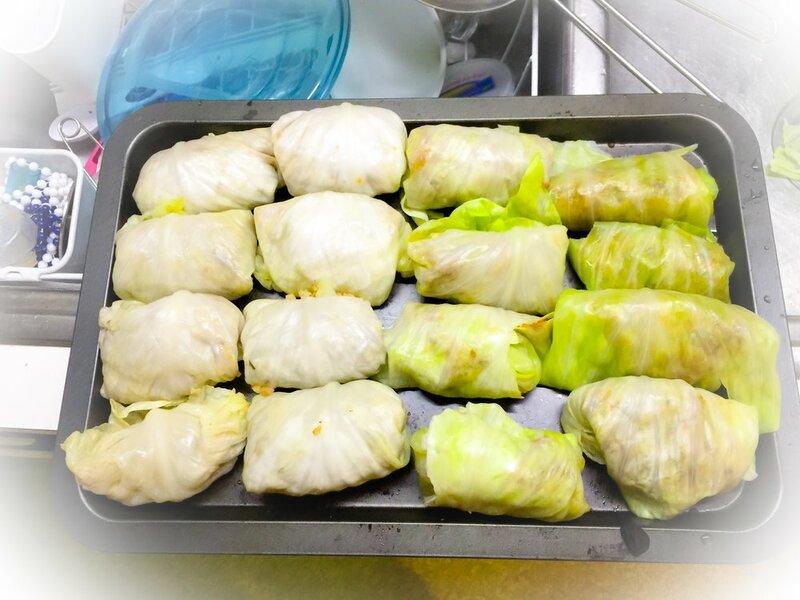 Many recipes call for lining the dish with cabbage to prevent burning…. There were leaves which had weird dark spots I was going to take off and just cook the leaf… and I don’t quite know the stringy part of the stem….vein… backbone? When it gets pretty stiff I wonder if it’s still to be used or how many layers to take off before using...and what were the black spots anyway? Soooo I still washed them and then just used them as lining- I figure parts of them can be eaten later...we’ll see what happens. And I hope some of that moisture reconstitutes the rice and it will come off.... I was going to soak it but again it was so yummy- maybe it’ll lift off and, well, we’ll see what happens. I don’t know WHAT mess you're talking about! It wouldn’t be authentic if some didn’t drop on the floor leaving more to be cleaned up! Some tomato sauce, but also made my own with some veggies and thank you again Vitamix!!! The sauce even tasted good on its own, not too “Tomato saucey” so hopefully mom will like this and it’ll be good to freeze so she can have when she is home from surgery.